UnifiedCommunications.com is all for bringing people together. Businesses of today are more connected than ever, but it’s still easy to be left out of the loop. By federating your UC platform, you can join us and many other organizations in a large and growing community of federated UC users who are enjoying the benefits of increased connection with their external networks, including suppliers, partners, customers and service providers. Don’t miss out! Don’t be a hater, be a collaborator. Federate your UC platform today. What do you mean by ‘federate’? To federate is to unite, while maintaining internal autonomy. In IT, federation describes the inter-operation of two formally disconnected networks that may have different structures. Email, for example, is federated: organizations may operate different email systems, but you can easily reach outside your network and connect to others simply by knowing your target’s email address. Similarly, federation of unified communications platforms allows users of different networks to connect and communicate with each other from their own local systems. Federated UC users from different organizations can web conference, IM, use voice and video features, share presence, and even share files and desktops with external users as easily as they would internally. There are considerations when federating your UC systems. As Microsoft Gold Communications Partners, UnifiedCommunications.com can share our experience with Lync and Skype for Business (SfB) federation. Give us a call now at 800.641.6416 to discuss solutions that involve federation. 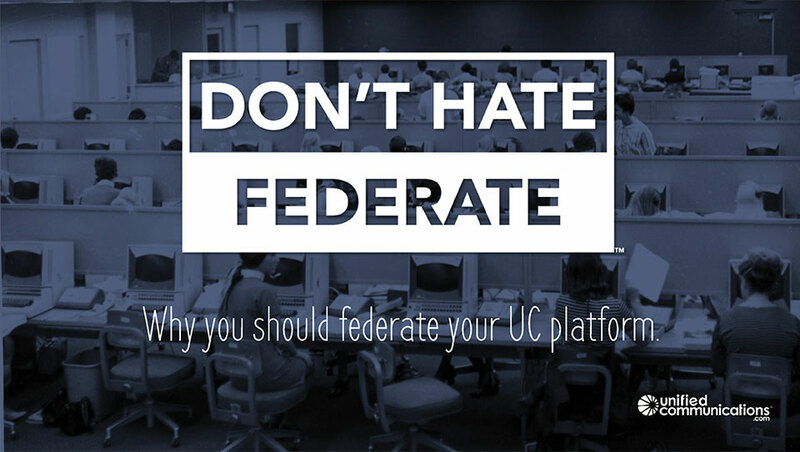 Broadcast your love for UC federation with this head-turning Don’t Hate, Federate t-shirt. Click here to learn more about this promotion or visit our online store to buy now.